As a managed service WiFi provider, Deep Blue Communications continuously undergoes rigorous testing to meet and exceed the highest hospitality & hotel WiFi standards. We are a Hilton approved StayConnected WiFi provider, Marriott GPNS certified, a Wyndham Worldwide Approved Supplier, and a Hyatt Hotel Approved Vendor. We work directly with major hospitality IT departments to deliver the best of breed technology to ensure you’re always in compliance with brand standards. Whether it’s needed for entertainment, conferencing, business, social media, fitness or gaming, we ensure your Hotel WiFi Network always satisfies your guests’ needs. Did you know that 65% of hotel guests login to the WiFi network within 7 minutes of arriving? * Their quest for satisfaction begins as soon as they walk into their room. Not only will a great hotel WiFi network help keep your guests satisfied during their stay, it increases staff efficiency, lowers costs, and generates a positive view of your hotel’s other amenities. The days of one device per user are long over, users can eat up bandwidth and slow your network. Deep Blue’s technology can cap user bandwidth so everyone stays connected. We offer tiered and higher bandwidth options that can integrate with your PMS system to authenticate charges directly to the room bill, and offer the flexibility of free zones for common areas. Simple click-to-connect allows hotel guests to accept terms in one click. No PMS system? We offer a simple password or single use code. For PMS integration, we offer folio authentication, utilizing last name and room number, and loyalty program integration. We supply hotel properties with brand compliant in-room tent cards, containing a direct number to our 24/7/365 U.S. Based Help Desk. If there’s ever a problem, we handle it promptly and professionally. Deep Blue offers login screens optimized for any viewing device. We can set limits on the number of devices per user, and provide shared bandwidth for optimal performance. Free internet is now a common request and prized guest amenity. Tiered bandwidth enables hotels to offer hotel guests free service or offer an upgrade to a faster paid connection. We can integrate your business systems with your Deep Blue WiFi network. Whether you require a PMS system, loyalty program, social media login, environmental controls, IPTV, VoIP, POS or custom development, our developers will get you connected. Whether you’re managing one property or many, the MyDeepBlue Dashboard delivers easy to understand data about your hotel guest WiFi experience, infrastructure and utilization, SNMP monitoring and guest metrics. Request a free demo today. Hotels are feeling pressured to provide free, fast and reliable hotel WiFi to support all these new devices. We offer monetization through social media authorization, which enables ROI. 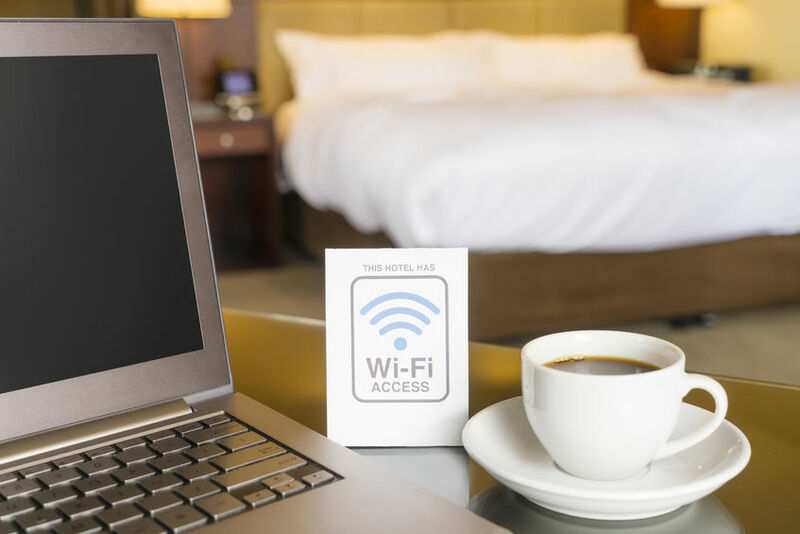 Because of the growing number of WiFi enabled devices hotel guests carry with them every day, hoteliers must stay knowledgeable about the WiFi technology that keeps their guests satisfied and returning. Do you know what the top uses for WiFi are in hotels today? Download this free whitepaper and find out. For more information about our hospitality & hotel WiFi services, support and installation, please contact us or call 1-844-544-3826 to speak directly to a Deep Blue Representative.